Let’s be honest; we can’t get enough of shopping. If we could, we would spend our whole pay check on clothes, homeware, movies, gadgets, and just about anything else we can get our hands on. Yes, although we know that material goods don’t bring you happiness, we dare you to think of a time when you’ve seen someone unhappy in a Ferrari. Slowly but surely we are ditching the designer brands and going old-school. Were picking out on our clothes instead of relying on personal shoppers, we’re filling our cars up with normal gas rather than premium, and were even shopping at the dollar store! In our eyes, there is no better shop than the dollar store. If you’re used to the finer things in life, going to the dollar store can be a little underwhelming. After all, there are no greeters there to welcome you into the store, there are no free testers, and there are definitely no personal shoppers to give you a little help and advice to spend $100 on something you probably don’t need. Instead, dollar stores go back to basics and try to give the average person what they wants. 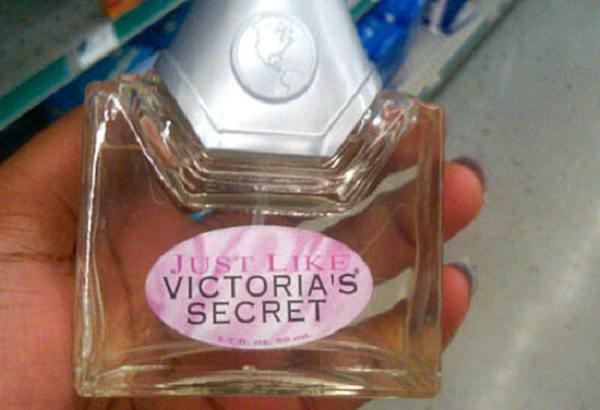 In this case, everyone wants to smell just as good as the Victoria’s Secret perfume but without the hefty price tag. You asked, the dollar store provided. Okay, we feel as though the people who named this store and the person in charge of marketing definitely didn’t have a discussion about anything before launch day – because this makes literally no sense. 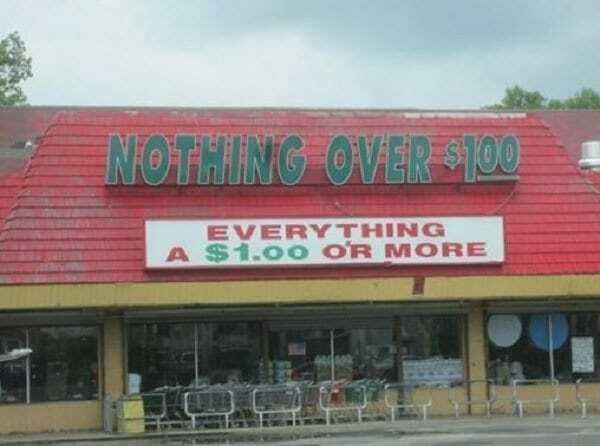 Is that supposed to be ‘Nothing Over $1.00?’ or ‘Nothing Over $100’ because we just really don’t know. This store could either be ridiculously expensive or it could be really cheap. We wouldn’t even bother going inside; there are too many questions for our liking. We’ll just go to Walmart. Have you ever been struggling to whip up something really yummy in the kitchen and asked your significant other to hand you the ‘Kitchen Thing’ so you could really bring that delicious dish to life? Yeah, us neither. While you might be able to get this at a dollar store near you, we don’t really know what to say about it, because we haven’t got a clue what it is. However, for a dollar we’d probably still buy it anyway, just in case we needed to do the doo-dah with the hoopley-dee-gook. 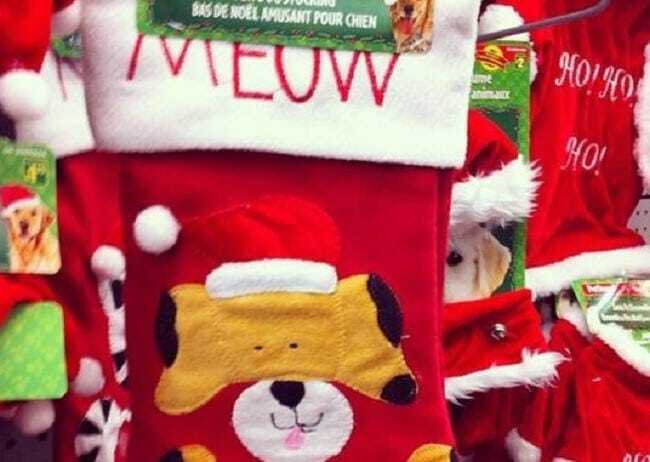 If you struggle with money around the Christmas period, you’ll be happy to know that dollar stores have everything you could possibly need to make your holiday season perfect – for a budget price! Do you know your ABCs? If you’re an adult, there’s a high chance that you could recite them without a care in the world, so let’s do it together! Triangle, circle, rectangle, square… That’s right, isn’t it? 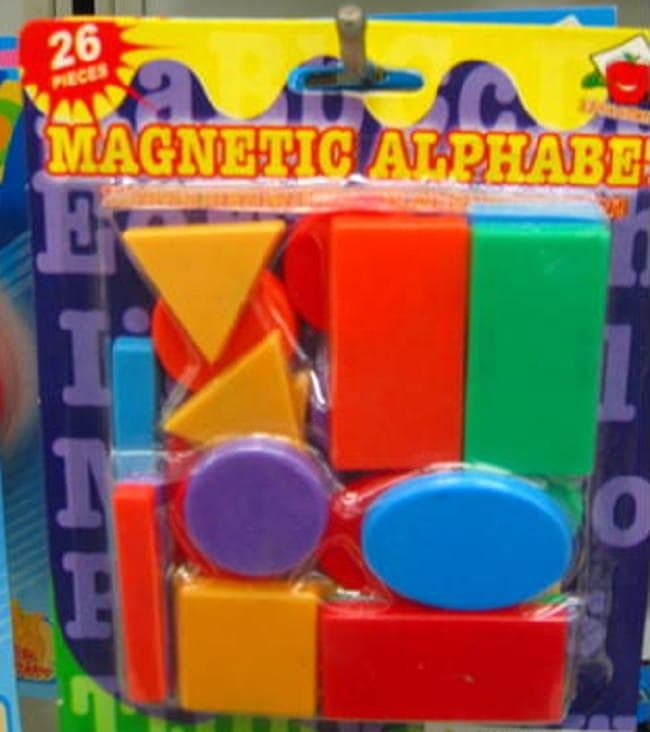 Well, according to this dollar store magnetic alphabet, that’s exactly how you learn your ABCs. You stick a few shapes onto your refrigerator, and you are magically blessed with an all-knowing knowledge of the alphabet. Wish it worked that way for calculus because we could really do with some help with our homework. The dollar store is perfect if you’re looking for cheap party decorations on a budget. You can fill a room with balloons, banners, and bunting, and you don’t need to spend a fortune in the process. However, we would suggest that you properly read the banner before taking it home and getting ready for the party. 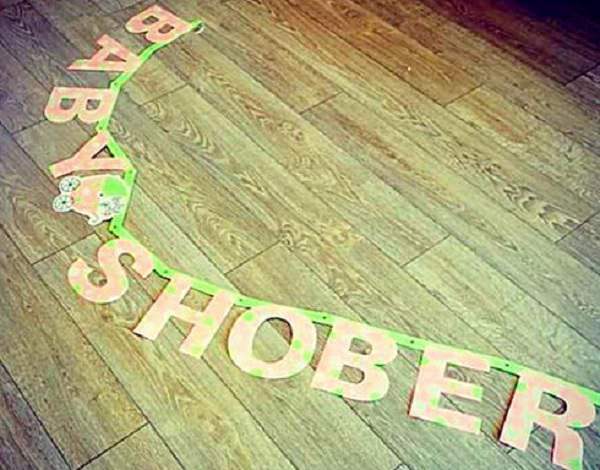 We’re not sure what a baby shober is, but were only going to attend if there’s cake. Is there cake? No? Then we RSVP a big ‘no’ to that invitation. Do you ever feel like you can’t control your kids? Like they’re just constantly getting on your nerves? Like they just never behave themselves? Well, we’d suggest that you invest in some behavior lessons or invite Supernanny around for dinner – because this is not the answer. 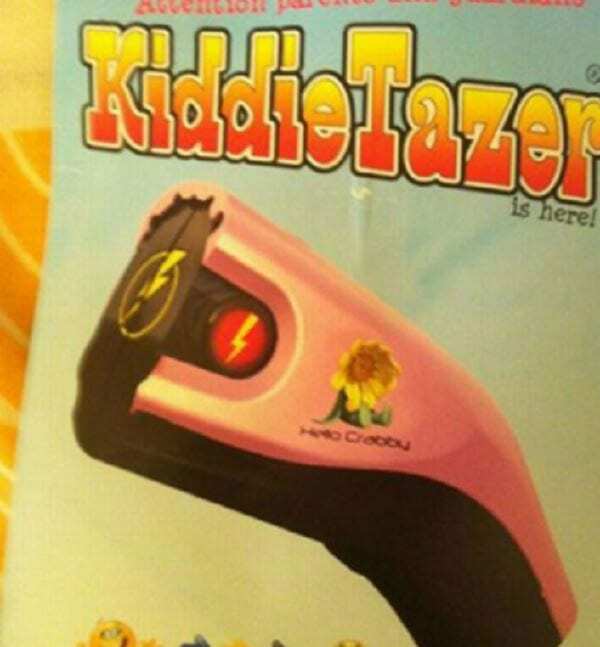 What amazes us is that there was somebody somewhere who not only designed this Kiddie Tazer but then took it to a corporation who then decided to sell it on their shelves. I mean, it’s definitely something we haven’t seen before. If you’re as obsessed with superheroes as we are, there’s a high chance that you want to buy every single Marvel product on the market. We can imagine that the person who bought this action man spent the whole day excited about their new dollar store discovery. After all, it’s not very often that you get the chance to buy an Avengers action figure for $1! Apparently this box was a new one because it featured a brand new Avenger we’ve yet to meet in the franchise. Fancy dress parties can be a nightmare if you don’t have an outfit sorted. Sometimes it’s just too expensive to order it all online, and you probably don’t have time to spend on finding the perfect combination in everyday stores. That’s why dollar stores are so popular because you can pick up ready-to-wear costumes that will suit any occasion. 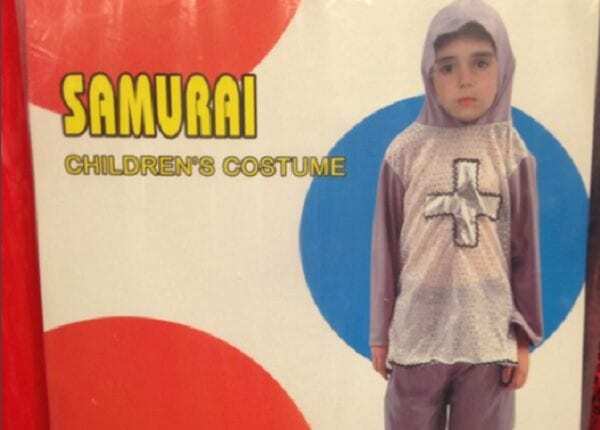 If you want any advice though, we’d avoid this children’s costume, because the kid doesn’t seem too happy to be wearing it. Also, this is definitely not a samurai. Although many people have criticized Barbie for representing just a small portion of the population, it’s fair to say that they are now trying to rectify their mistakes. They are now attempting to make their dolls as relevant as possible to entice a wider market. Although we understand where they were going with this new doll, we have to question whether anyone would actually buy this for their child. I mean, we don’t have any words. 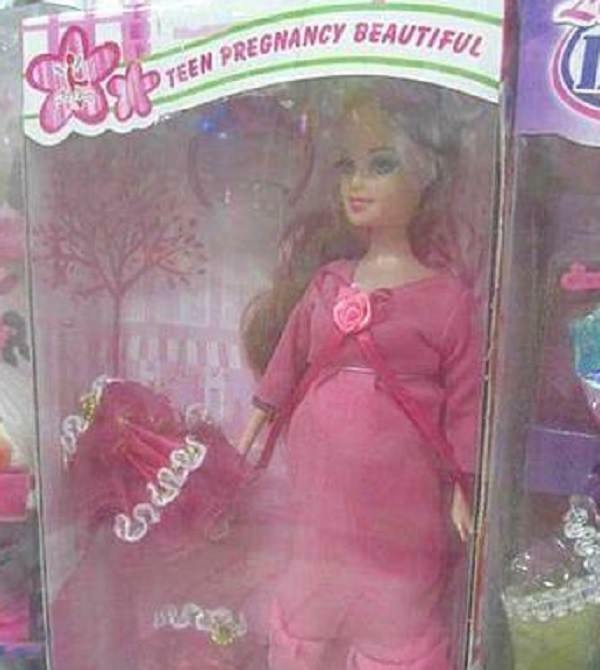 You do you, Teen Pregnancy Beautiful. Congrats on the baby. It’s very rare to see action figures of religious people, but this dollar store decided to do something a little different and appeal to another audience within their stores. Yet, we feel as though they probably didn’t do their research before manufacturing this figure. 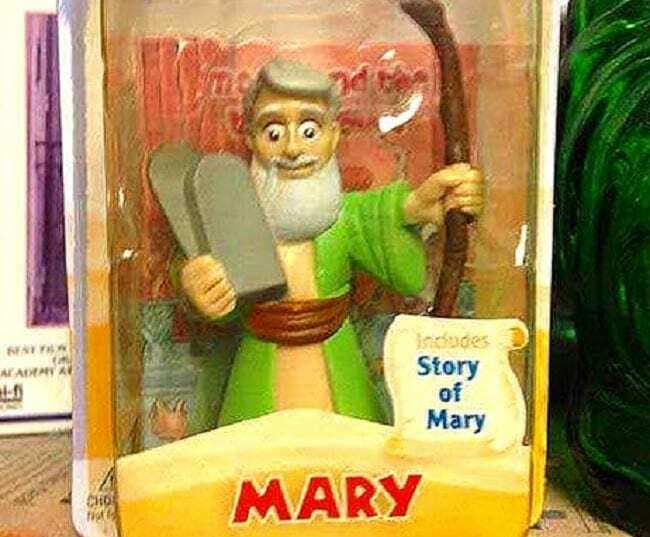 After all, we’re pretty sure that Mary is actually a woman, and this figure is a man – but there you go. While we can’t say that we’ll be rushing to the store to pick this one up, we appreciate its sentiment. Finding cool clothing in the dollar store is like finding a box of Krispy Kremes on your way home from work; it’s the best thing ever. It’s even better when you actually like the item and could see yourself wearing it regularly. This person probably thought they were in luck when they spotted this t-shirt in the dollar store, but there’s just something not quite right about it in our eyes. Is Asia spelled correctly? Is it the right color? 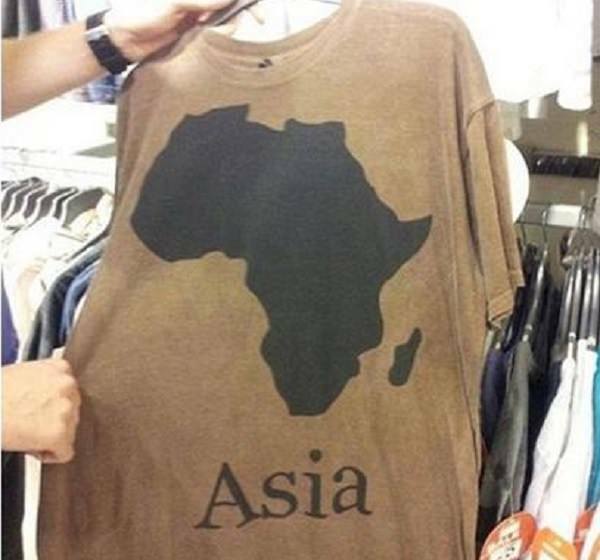 Or is the fact that that continent is actually Africa? As you get older, your joints start to crick and crack, and they can sometimes get pretty darn painful. If you find yourself struggling you can easily pick up a knee support at your local convenience or dollar store. It could solve all of your problems! At least, it could solve your problems if you bought the right one. 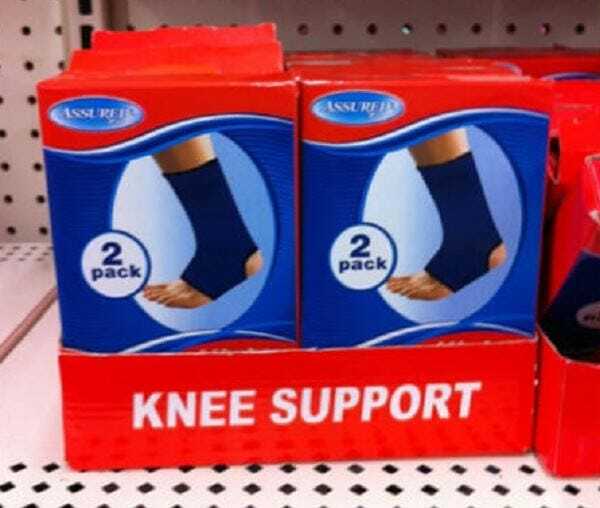 While we appreciate the fact that this is a 2-pack set, we have a feeling that this ankle support wouldn’t do a lot to help out knees. Just a hunch though. Although we don’t like to categorize and stereotype animals, it’s a well-known fact that dolphins are pretty darn harmless. They are always chilling out with humans and saving them from disaster, and they’ve never done anything to annoy us. 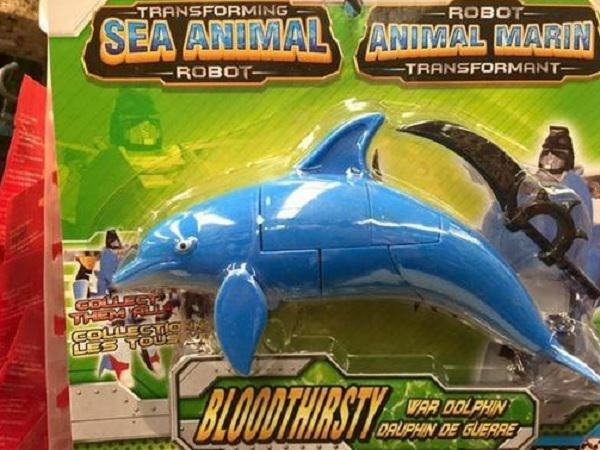 Because of this, it’s hard to imagine a transforming sea animal robot that wants to send you to sleep with the fishes. Also, there’s no way that dolphin could hold that battle axe with its fin and attack a human. It just wouldn’t be able to get a grip on the handle. 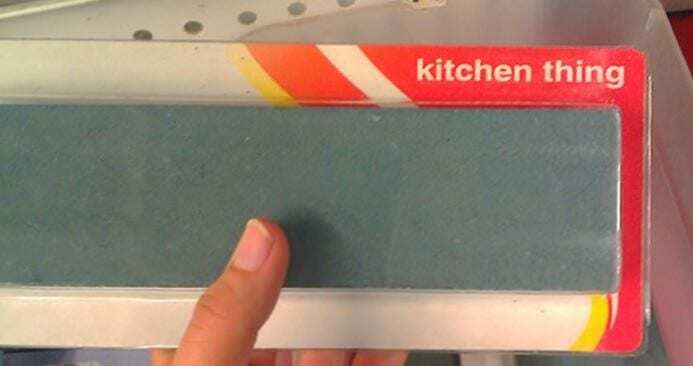 One of the best things about a dollar store is that you can uncover random and unique products down the aisles – and they’re normally the exact opposite of what you would expect to find in a dollar store. 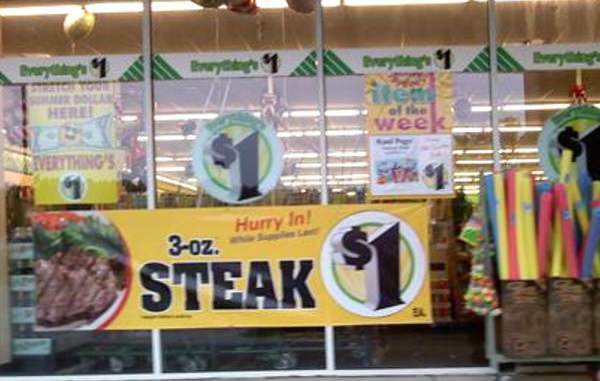 So, although we can imagine that it was pretty weird to find a $1 steak in this dollar store, it’s not completely unheard of. Yet, we do have to question the steak. What kinda steak is it? Beef? Antelope? Rat? There’s just no way of knowing, so we’ll just pass on steak night this week. 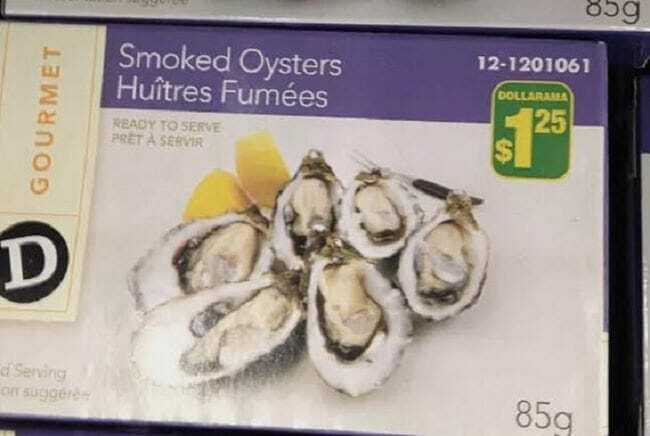 Oysters definitely have a reputation associated with them, so we can imagine that lovers flocked to this dollar store to buy these frozen oysters when they were released. Although they may be a little pricier than the other products in the dollar store – we bet they were worth it. Or they might not have been. Actually, we can’t imagine that frozen oysters that cost $1.25 would be that tasty, but for $1.25 we would try anything. Just poise yourself for a potential sickness bug, because it could be coming your way. Store names are often so confusing, and we really have no idea what they’re selling or for what price. 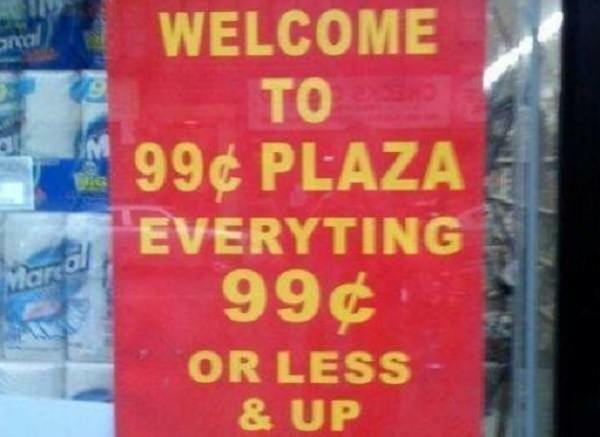 When we saw this sign, we were at first impressed that the 99-Cent Plaza was selling everything for 99-cents or less. What a bargain, right? But then as you read on, you soon realize that everything is 99-cents or less, but it could also be 99-cents and more. It’s a little too ambiguous for us, and we think it should just be renamed The Plaza instead. Makes more sense. Ever thought of a movie crossover idea and wondered why it was never a thing in real life? 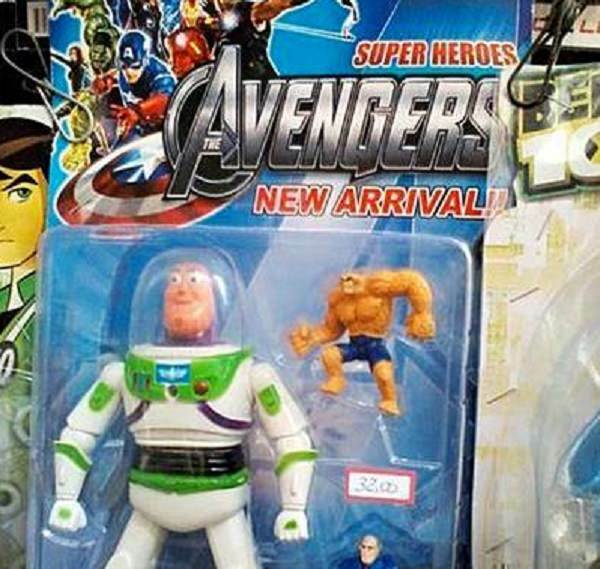 Well, the person who manufactured this set of superhero toys obviously thought the same, because he decided to take matters into his own hands and make it happen anyway. 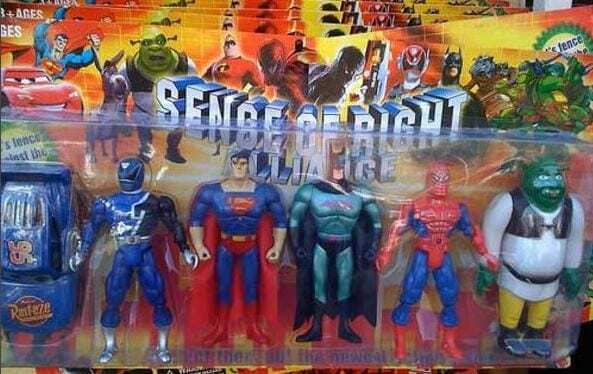 Yes, he decided to bring together five of the most incredible superheroes of all time; the Red Power Ranger, Superman, Batman, Spider-Man, and Shrek. After all, if we ever found ourselves in a sticky situation we would definitely want Shrek involved. If you’re into odd food, the dollar store is a great place for you to enjoy. Not only do they have all kinds of weird and wonderful food products, but they are also as cheap as anything! 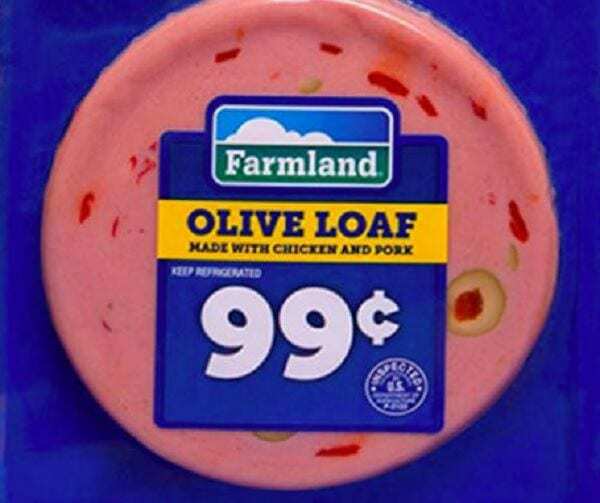 Yes, you can get unbranded potato chips, candy bars, and even frozen oysters – and it seems as though you can also get Olive Loaf made with chicken and pork. Of course, we don’t really know why you’d want to try this odd concoction, but it’s nice to know that it’s an option if you wanted to. Dollar stores are perfect if you’re looking for anything and everything. Fancy some food? Go to the dollar store. Fancy some new cushions? They’ll have some at the dollar store? Need to stock up on deodorant? The dollar store will sort you out! Because of this, they often like to open later and for longer than other stores. 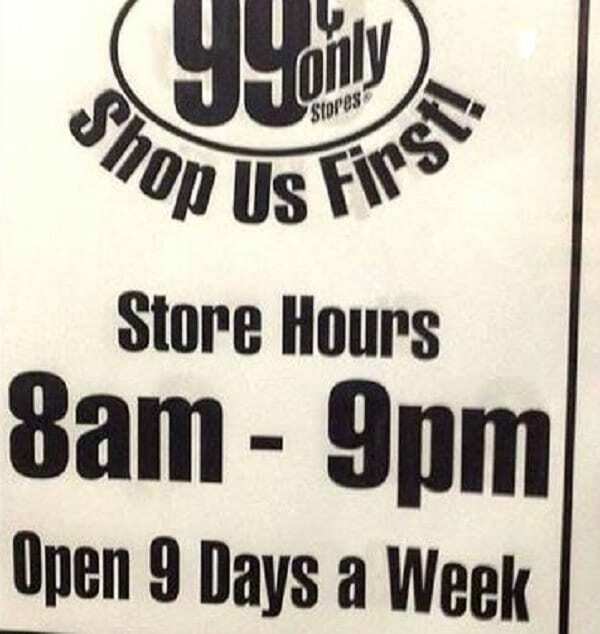 In fact, this store decided to out-do all of the other stores in the area by opening nine days a week. We’re not sure how, but it’s still impressive. The more we look at this toy, the more questions we have. Firstly, why the heck is it called a Hernia Lamp? 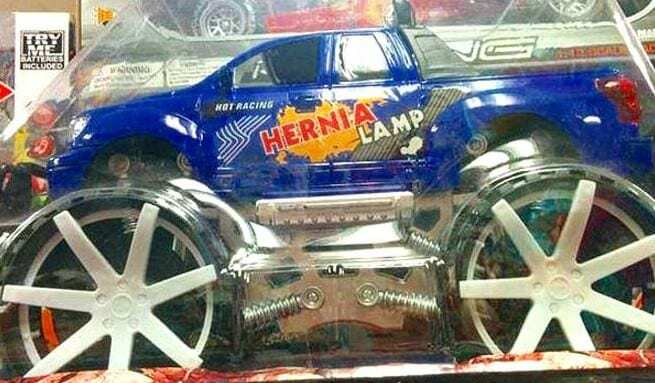 What even is a Hernia Lamp? And why is a race truck ‘Not Racing?’ In all seriousness, this is a pretty cool truck, but it seems as though you can’t do any cool things with it. There might be a reason for that though. Perhaps if you race this truck, you’ll actually get a hernia. That $1 is definitely not worth the medical bill when you’re in a huge amount of pain. Keeping your nails clean, tidy and clipped is an important part of adulting, but if you struggle to know exactly what you need to do it’s best to find yourself a manicure set and let that do most of the work. 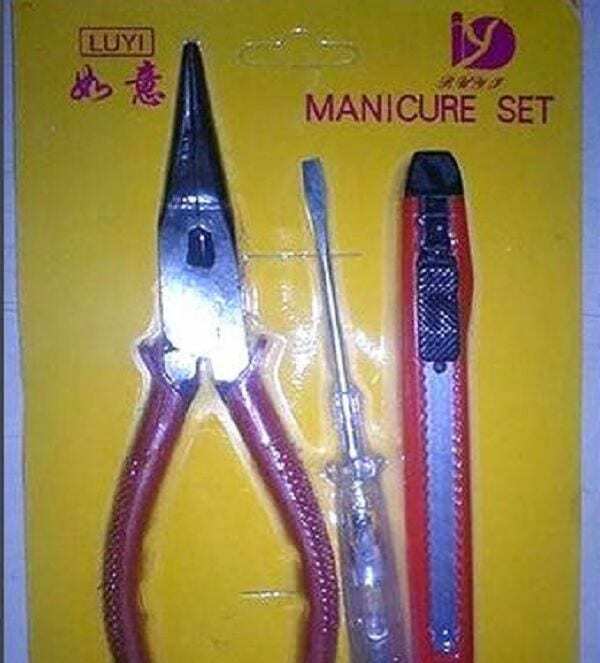 However, we’d advise against buying this manicure set, because it might hurt a little. While it probably would clip your nails and give them a little TLC, we can’t imagine it would make them look that great. I mean you can give it a go if you really want. Probably best not too, though. 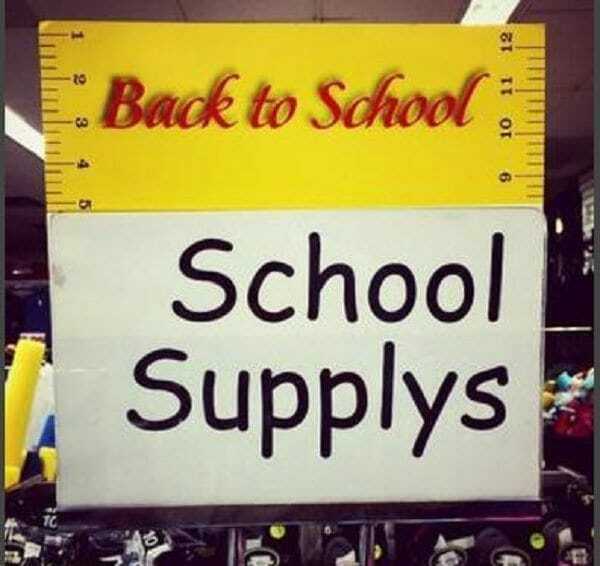 Who else loved going to the store to pick up their School Supplys? At least, that’s what we did love to do until we went to school and realized that that’s not how you spell it! 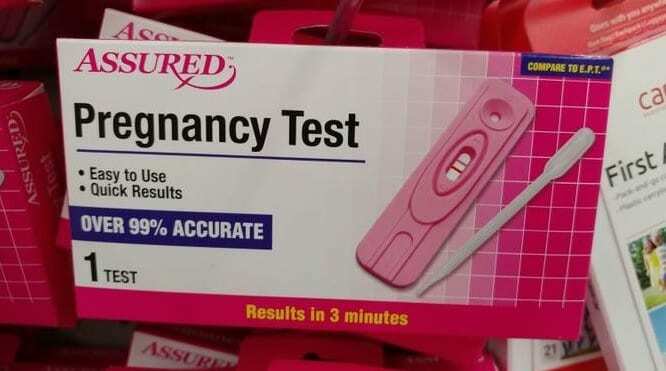 There are some things that you just shouldn’t buy from a dollar store, and we feel like a home pregnancy test should be at the top of that list. While we are impressed with the fact that it’s easy to use and offers quick results and a 99% accuracy rate, we just don’t trust something that costs $1. We especially don’t trust it in a store that often sells joke products. The last thing you want is to tell your family to realize it was on positive all along.